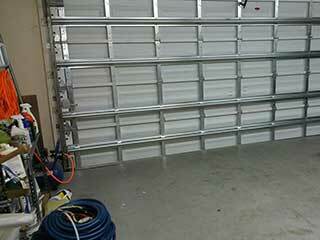 Professionally inspecting the condition of the garage door parts now and again is vital. This will give you a clear idea about whether any work is needed soon to prevent more serious issues from developing in the future. The fasteners (screws, nuts and bolts) must be tight to prevent important parts in the system from becoming misaligned. Fasteners make sure the brackets and hinges are secured, so that you can feel confident that the bigger components like the tracks, cables and the door itself is properly in place. If the pulley bolts for example, are not tight enough, the pulleys are at risk of splitting in two and causing the door to jam. Hardware must be lubricated or the noise of the door's movement will be at risk of friction and will likely deteriorate faster than necessary. Good quality lubricants ensure that when two different parts made of steel come in to contact with one another, they do not rub against each other. If your system starts generated loud noises, this could be a sign that lubrication is in order. Your opener sensors are the most important parts of your system when it comes to safety and they should be checked as often as possible. You need to ensure they stop the movement of the door if something is in its path while closing. You can test this functionality by placing a small object under the door to check if the door reverses. Our technicians will fully test this part of your system and ensure there are no hidden signs of failure. You should consult your manual for the recommended lifespan of your springs as it's best to replace them before they snap. During a service visit, our technicians will check the bearings and brackets of the springs as well as its level of tension – we will adjust the cables if needed. The weather seals at the top, bottom and sides of the door ensure the good insulation of your garage. They also help to keep insects and elements out of the garage which is why they should be checked and if found worn, replaced immediately. Give special attention to the bottom seal since intruders could take advantage of a small gap under the overhead door! If you think it's about time you booked a maintenance appointment, just contact our garage door repair experts in Ramona today, we'll be happy to discuss your needs with you.